North Carolina has a long legacy of public history. Our state's historical program, founded in 1903, has evolved into what is now our Office of Archives and History (OAH). The agencies of the North Carolina Office of Archives and History celebrate history from pre-colonial times to the present. They collectively safeguard documentary and material evidence of earlier generations and provide leadership and assistance to government agencies, individuals, businesses and organizations to further the stewardship of the state's historic resources. OAH's mission is to collect, preserve, and utilize the state's historic resources so that present and future residents may better understand their history. Collecting, preserving and displaying artifacts to educate the public about the state's past. We look to the future as it endeavors to save what is important from the past and present for the education and fulfillment of all North Carolinians. The character, cultural identity and direction of North Carolina emerge from its historic heritage. I am pleased to release the 2014-2016 Biennial Report of the Office of Archives and History. Every other year since 1903, our agency has made a report on its activities to the governor and the members of the North Carolina Historical Commission. 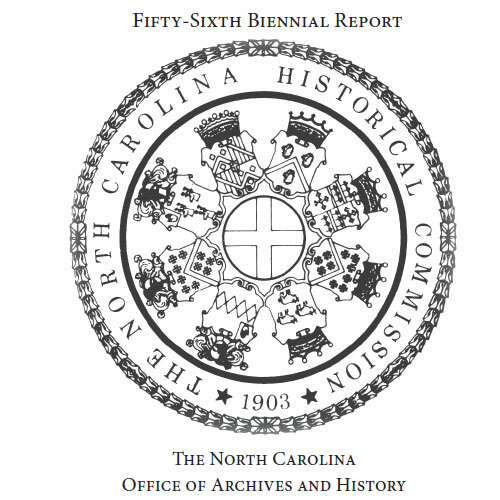 The Biennial Report stands as the official record of our agency, and taken together, these fifty-some publications provide a remarkable, detailed history of North Carolina’s state-sponsored, public history activities. As an addendum, to this report is a 20-page summary of the department’s Civil War Sesquicentennial Observance. A quick skim through the list of “CW 150th “ programs provides evidence for our “150th” being among the largest, if not THE largest in the nation. A big “thank you” to all who have contributed to the creation of this document, especially Mike Hill who has acted as its chief editor for at least the last decade. North Carolina’s Office of Archives and History is the most comprehensive, state-based, public history program in the nation, including archival, museum, historic site, historic preservation, research and publishing, archaeology, and ceremonial/commemorative activities. Our services, exhibitions, publications, and programming regularly receive the respect and admiration of our colleagues from across the nation and the approbation of the people we serve daily here in the state. My sincerest thanks to all of you who do the important work of preserving and presenting our past to the public so that we can all better understand ourselves and our state, using the past to build a better future for us all. The N.C. Literary and Historical Association works in tandem with the Office of Archives and History to foster interest in the state's literature and history and encourage productive literary activity within the state among many other goals. A service branch of the Office of Archives and History, DNCR's Western Office offers professional expertise in historic resource management and is home to western regional branches of the Office of State Archaeology, State Archives amd State Historic Preservation Office. Though the country didn't officially enter World War I until 1917, North Carolinains volunteered to fight with British, French and others almostly immediately after the conflict's outbreak in August 1914. Nearly 2,400 North Carolinians died in World War I, and in 1917 and 1918 more than 60,000 were drafted to fight. Through 2018, we'll commemorate the centennial of their sacrifice with special publications, programs and educational resources.